Do you have a friend who loves animals? Finding that perfect gift can be stressful, some presents are just not enough. You could buy them an animal book, a stuffed animal, but what really takes the cake is an interactive experience that they will never forget. If your friend is enamoured by llamas, then you’ve found the right place. The Llama Experience is the best moment a llama lover could ever ask for. What is the Llama Experience? This unique opportunity is the chance to be around and interact with llamas on a 10-acre smallholding on the edge of Brigstock, Northamptonshire, this scenery is ideal for those seeking refuge. Each of the three llama boys is loved and trained by their owner Nicola Newbery, who describes her boys as being quirky and curious, wanting the right amount of attention from their visitors. What Happens at the Llama Experience? The experience starts off with three llamas out in the paddock. With supervised instruction, you will then herd them into their stable, also known as Llama HQ. As this is a couples experience, or friends for those who would prefer it that way, the two llamas are then haltered up and groomed. Then, you will enjoy a stroll around the farmland for about 40 minutes. You will be able to walk your own llama. Once returning, the llamas will be turned out while you can choose to relax on the deck or venture to the Llama Lounge. The Llama Lounge overlooks directly into the paddock so that you can view them while you relax. With the natural curiosity of llamas, it is common for them to come check out what you’re doing. This time is dedicated for relaxation and will last for around two to three hours. During this portion of the visit, you may also indulge in one of our three food and beverage experiences. What Does the Llama Experience Offer? The Llama Experience currently offers three different types of experience deals. Each experience holds a variety of hand-selected refreshments that you can enjoy while you relax in the Llama Lounge. Pick from the three packages for a unique experience that will leave a loved one feeling refreshed and pampered. This package is priced at £45 P.P and is a great opportunity for those who are early birds. Included in this meal are the finest croissants and pastries to accommodate your hot cup of coffee. All of these delectable foods are selected from the award-winning Hambleton Bakery. The lunch experience is one of the most popular packages for its platter of tasty food (posh ploughmans!). This package offers freshly baked bread as well as cheeses and meats that are all locally sourced. The lunch experience can be purchased for a price of £55 P.P. + complimentary glass of prosecco / wine or beer. What relaxes the body more than a warm tea surrounded with the rural paddocks of three beautiful llamas? It’s hard to think of an answer for this package not only offers a warm mug but also includes homemade scones, jam and cream, cake and sandwiches that are finely cut for the perfect brunch. You can buy this package for a loved one at the price of £45 P.P. What Do You Wear to Meet the Llamas? Dressing in the appropriate attire is crucial for any animal interaction, let alone three llama boys. It is important to wear closed toed shoes, preferably boots if you have them. Other rules to keep in mind while experiencing this lifetime opportunity is not to bring any dogs as that will frighten the llamas. If your loved one has a special occasion, feel free to celebrate that at the Llama Experience. Who Will You Meet at the Llama Experience? The three stars of the show are Miguel, Luca and Jiminey. These llamas have been pre-selected and trained to make this opportunity the best that it can be. Each llama has his own individual personality. Luca always has Jiminey’s back, but is best described as the leader of the pack. Miguel is the most timid out of the three llamas at the Llama Experience. He can be often described as a scaredy-cat. With most animals, there is a pecking order. Unfortunately, Miguel seems to always end up at the bottom of the totem pole. His gentle nature is great for those unsure about llamas. The head hauncho of this little herd is Jiminey. But don’t let that scare you off. He is also the most affectionate, making him the “gentle giant” of the three llama boys, the Main Man. 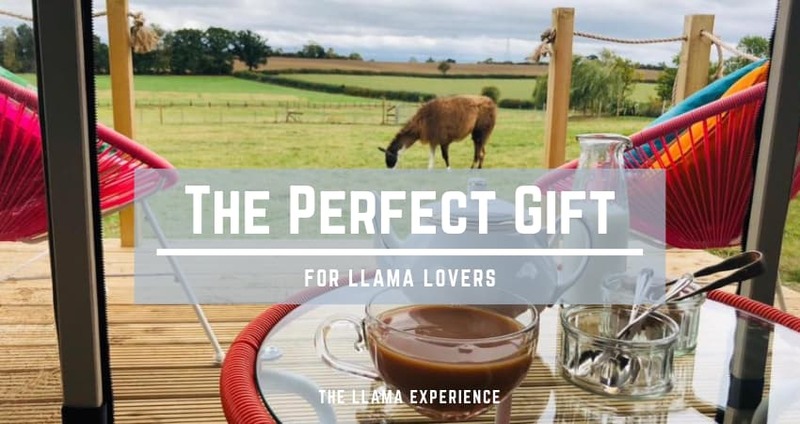 If you want to surprise your loved one with a preliminary gift as a hint, then the Llama Experience has a variety of smaller presents that will help connect the dots. Leave them thinking that this is the real gift instead of the amazing experience to come. The Llama Experience offers a diversity of llama lover gifts such as glass work top savers, cushions, mugs, mouse mats and a llama calendar. Some of these items even include the beloved individuals that you may go see. The Llama Experience is a unique opportunity that makes the perfect gift for any llama lover. Mixing hands on interactions with a carefully planned relaxation time, consider this option for your loved one. Come meet the three boys, Miguel, Luca and Jiminey!